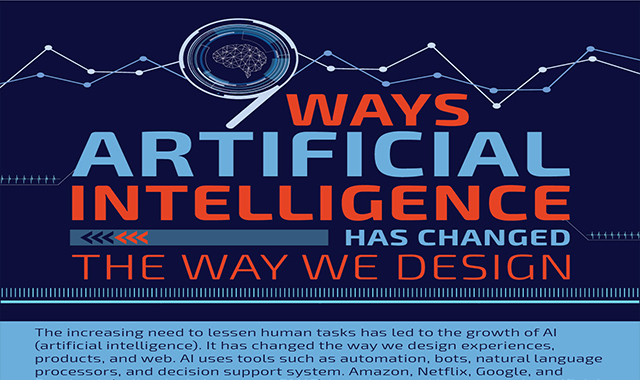 How Artificial Intelligence Has Changed The Way We Design #infographic ~ Visualistan '+g+"
The Artificial Intelligence business is up by 70% in 2018 and by 2022 it will become a $3.9 trillion industry, says Gartner. AI is by far the most disruptive technologies! It became an academic discipline in the 1950s and pushed itself into the mainstream corporate and commercial setting by helping humans with planning, knowledge, processing, reasoning, representation, perception, natural language, construction, manipulation and designing. On the surface, we’ve categorized a few things as being artificially intelligent and others not. But the task to describe this phenomenon isn’t as simple as saying ‘it is a machine or system that is intelligent.’ Well, a calculator is smarter and faster at mathematics than a human, but is it intelligent?